← Vermont must be lovely this time of year… all that snow. I keep telling myself that it is time to trust in the process, to know that we are still recovering, and that it will be ok. There are deep changes afoot and they are not ready to be born just yet. It’s good to remember that knitting helps when one is sailing upon deep, dark seas of emotion. Mostly I am knitting small things. Simple things. I am knitting for comfort these days. 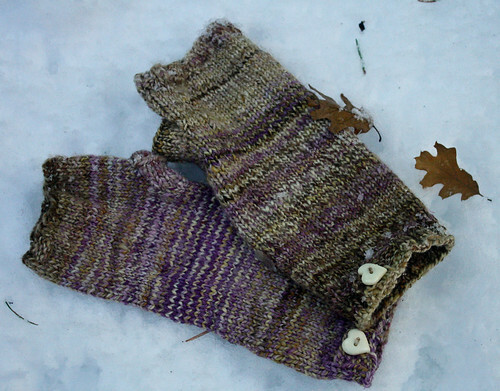 A pair of warm woolen mittens for my daughter. A striped hat for the Captain’s sweet boy. Not a lot of challenge in them for the most part, but sometimes you just need simple comfort. Knitting, as always, serves as an apt metaphor for life. And sometimes it does double duty as a flotation device. Spent a frustrating couple of days trying to knit a pair of mittens as a gift for my daughter. I have never done mittens before. The first pair wound up being a bit lumpy and the decreases were clumsy and uneven. My needles were a bit small for the yarn I was using (Manos), hence the frustrating part. It worked out, though, as the extra tight knit wound up being great for the subfreezing temps we are experiencing right now. I decided to hang on to the lumpy little things and executed a second, more perfect pair, in soft white Malabrigo. Finally got the hang of it now, and a formula for making a thumb gusset. 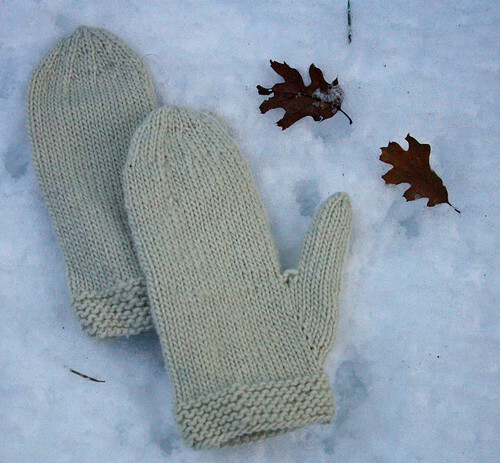 Crazy mitten ideas are racing through my head like wildfire. It’s too bad the bulk of my friends are in Los Angeles because now I want to make mittens for everybody. Warm things. Useful things. Small things. Things made of Malabrigo. That’s just how things are rolling right now. But. There is lace on my horizon, count on it. If only I could read the future like a piece knitting. No gaps in what should be unbroken. sliding off these bamboo needles. The thick and the thin, sometimes splitting and fraying. really came off quite this effortlessly. This entry was posted in knitting, Strings, Sticks and Wheels and tagged handspun, hats, knitting, mittens, warm things, yarn. Bookmark the permalink. Now there’s poetry. Both in the poetry itself and in the beautiful solidity of the useful things.